Europe Snacks - moisture, oil and degree of bake | Quality2Process B.V.
Europe Snacks, one of France’s leading producers of own-label savoury snacks, is utilising the MM710e on-line NIR analyser from NDC Infrared Engineering for quality assurance on its purpose-built production line dedicated to savoury crackers. The MM710e gauge continuously and simultaneously measures the three parameters that are central to this product's quality: moisture content, oil content and degree of bake. Accurate and reliable measurement of moisture content, oil content and degree of bake make an essential contribution to customer perception of the product quality, which in turn supports customer loyalty to the product. Control of the moisture content determines how the customer perceives “the crunch” when biting into the product and is also vital to optimizing shelf-life. A proportion of the oil is sprayed directly onto the product after baking to give the product its palatability and pleasant flavour sensation in the mouth. 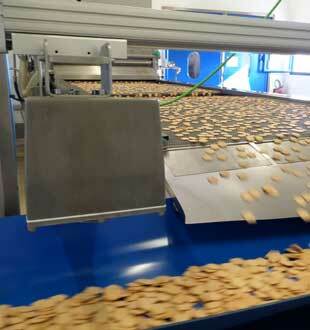 Measuring the quantity of the spray-applied oil continuously on-line enables Europe Snacks to control the consistency of the application. The degree of bake measurement corresponds to the way in which the human eye perceives the surface brownness of the product. For the snacks industry, NDC has extended its unique optical gauging technology beyond the infrared spectrum (where water and oil absorb at discreet wavelengths), to the visible spectrum. 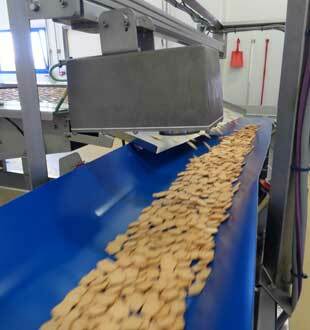 Europe Snacks uses this capability to ensure that every batch is baked to the same rich brown colour. As part of integrating the MM710e into the process, the instrument was calibrated against Europe Snacks’ primary reference methods, to ensure that the on-line measurements agree absolutely with the values obtained for the same parameters in the laboratory. The MM710e was also supplied with an “Auto Reference Standard” which is used to check the opto-electronic stability of the gauge – vital when the gauge holds a position of such strategic importance in quality assurance.